Ever wonder about all that stuff on Rachael's Ray's set? The cool fridge, cutting boards, and accessories? Well, the Food Network was kind enough to put all that information in one place, while making sure to state that "Food Network has no affiliation with any businesses or enterprises featured on the network and makes no representations, either express or implied, as to the goods, services, creditworthiness, and/or financial standing of those businesses." Blah Blah Blah. Darn lawyers. Surprisingly, lots of the stuff on her set is vintage, like the salt shakers and the Dansk cookware. 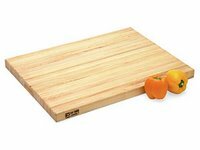 One of things missing from the list is one that I covet - her Boos block cutting board. But, the thing is a monster and I don't really have a spot for it. And do I really need a cutting board that is hand-crafted from hardwood maple? Probably not. BTW, have you noticed that the style of this blog matches her set too? Okay, maybe that's a stretch, but I tried!